$24.75 This item is selling for $24.75 on eBay. Sequins, sequins, and more sequins! 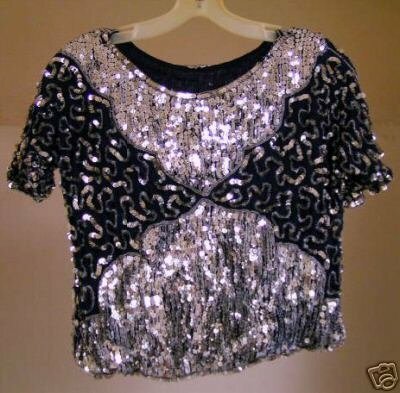 Beautiful heavy sequined top in navy and silver. I don't see any sequins missing, if they're are, they're not showing. Nicer than photo. Bust- 36"-38, Back length-17". 100% silk with rayon lining. Combined shipping at half off for additional items. Buy more, save more! (don't forget the discount of 10% off over 30.00) PLEASE READSee policy link. I will be selling off various mixed merchandise from my closed consignment shop. All is in excellent condition unless stated otherwise. I describe items to the best of my ability, so please consider complete listing and MEASUREMENTS to save conflict later. We both want a fair and pleasant transaction now and in the future. Please ask if there is any confusion about the listing and I will do my best to answer in a timely manner. Here's hoping for a long and pleasant relationship with you. Sincerely, Lulu [[sequin woman's top navy silver mardi gras evening]] COMBINED SHIPPING at half off for additional items other than BOOKS. Add a dress, hat, shoes, purse / bag, shirt, blouse, pants, jeans, skirt, earrings, necklace, bracelet, or nightgown. Some are vintage, some new or nearly new. Buy more, save more! Please Read profile and policy links. I will be selling off various mixed merchandise from my closed consignment shop. All is in excellent condition unless stated otherwise. I describe items to the best of my ability, so please consider complete listing and MEASUREMENTS to save conflict later. We both want a fair and pleasant transaction now and in the future. Please ask if there is any confusion about the listing and I will do my best to answer in a timely manner. Here's hoping for a long and pleasant relationship with you. Sincerely, Lulu Check out my other items! Please enjoy your shopping experience.